Hand forged in Storvik, Sweden, the S.A. Wetterling Axe with hickory handle represents 100 years of Swedish tradition. The best Wetterling axes like this one are shaped by hand forging, a process that requires patience, time and a high degree of skill. The end result is a better axe. The usual axe you find in a hardware store today is a crude tool compared to the standard item a hundred years ago. As axes fell out of use, companies substituted simpler processes, producing tools meant for occasional work. To understand the difference requires working with a good axe like the Wetterling. The hand forging gives the knife more strength than ordinary drop-forged steel and allows edge-tempering to a harder 58 to 59 on the Rockwell scale. Professionally ground at the Wetterling factory, the axe cuts deep and smoothly, turning tough chores into interesting work. 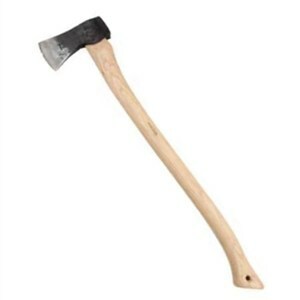 You can also count on getting the best grade of Swedish steel in this Wetterling axe, made of a modern high carbon steel alloy bolstered with silicon, manganese, and vanadium for edge retention and corrosion resistance. Wetterling stands apart from most axe manufacturers in another important way, paying as much attention to the quality and fit of the axe handle as to the axe head itself. Most forges buy handles in lots from other companies, but Wetterling picks its own American hickory stock and mills handles from the best pieces on-site at the Storvik facility. You won't get a good axe with a bad handle that shatters on the first swing. Both halves of the tool meet high standards. For a look at a modern "best axe" from an American company, see the Ames Premium Michigan Wood Axe.